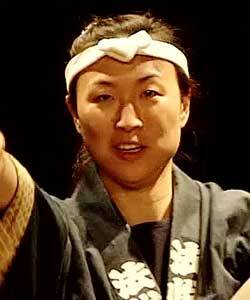 Sue Kanagawa Yuen is a performing member of Jun Daiko, a taiko group in Mountain View, CA. She and other members have studied Edo Bayashi with other “taiko nerds” in the area, and Jun Daiko received an Alliance for California Traditional Arts Grant (ACTA) in 2014 to bring Kyosuke Suzuki for several in-depth workshops on it as well as another traditional festival piece called Edo Kotobuki Jishi, the exciting lion dance of old Tokyo commonly referred to as “shishimai”. From her first exposure to the art form over 20 years ago, Sue’s affinity for it has grown and she has gradually grown into a proud Edo Bayashi nerd. 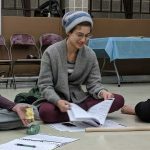 Sue (and her camera loving cats) was gracious enough to sit down with HET performing member Emily Harada to share her own Edo Bayashi journeys, comparing it to “eating your taiko vegetables” for good taiko health. 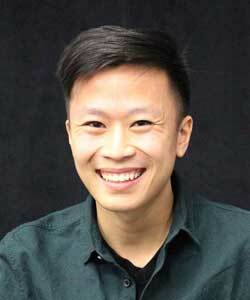 Fellow HET member Oscar Chen edited this interview and provided editorial commentary. Sue first began studying Edo Bayashi during her time training and performing in Hawaii as a member of Kenny Endo Taiko Ensemble (KETE) between 1996 and 2005. Kenny Endo himself had studied Edo Bayashi from Maru-sensei of Wakayama Shachu while living in Japan in the 1980’s, but it wasn’t until another member of KETE received a grant from the Hawaii State Foundation on Culture and the Arts in 1998 to study Edo Bayashi that he began regularly teaching it to supplement the ensemble’s regular taiko studies, a practice that continues to this day. Sue studied alongside the initial grant team in 1998, oftentimes joined by Suzuki-sensei visiting all the way from Tokyo for supplemental workshops. 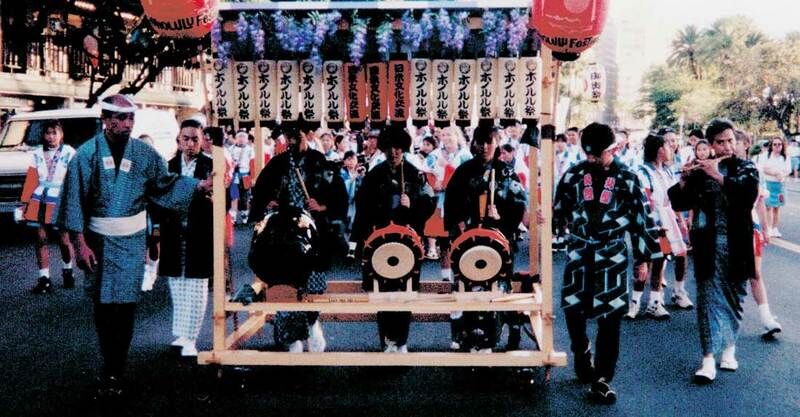 While the suite was seldom performed on-stage, KETE would often perform it at local festivals, lending a Japanese matsuri air to the celebrations. Not all was so festive and easy-going though. 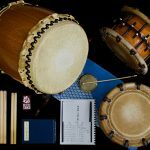 Even for an experienced taiko player like Sue, beginning the arduous process of studying Edo Bayashi was a difficult context switch to make at first. Gone were the “flashy arm twists and bachi twirls” of kumidaiko, with leg-numbing seiza sitting positions and complex syncopated rhythms learned by rote memorization taking their place. For Sue, Edo Bayashi was a way of engaging with taiko without constantly performing and instead focusing on developing her own musicianship. As an ensemble form, playing it together in a group was still a challenge to master while also being “more meditative and within yourself”. Speaking for Ho Etsu members, we can relate! We’ve begun incorporating Edo Bayashi rhythms into some of our soloing drills, drawing upon its improvisational nature and focusing on creating new music from its toolbox of patterns and rhythmic structure. Edo Bayashi has neither a forgiving learning curve nor is it immediately rewarding in a visceral sense, but its benefits come through dedicated, consistent practice. Just like eating your vegetables! 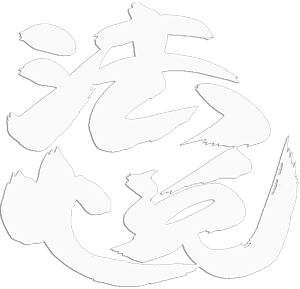 As an example, a few practices ago we spent some time revisiting Lion Chant, a piece written by our collaborator Shoji Kameda that includes several riffs taken directly from the shishimai repertoire. Although they originate from different lineages, shishimai and Edo Bayashi share a common musical language and so are remarkably similar in some sections. For members with previous experience with the piece, these funky riffs were notoriously counter-intuitive to learn at first (prior to studying Edo Bayashi), being difficult to pin down to any one time signature. This recent practice was different though! 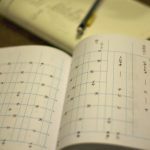 Now armed with a practiced sense of uniquely Japanese patterns and syncopations, those Lion Chant rhythms instead felt like a familiar language to us — so much so that we found ourselves finishing the sentences they started with patterns we learned from Edo Bayashi. 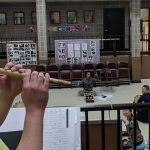 “It’s like learning Edo Bayashi has forced us to get away from a Western idea of structure and rhythm that we were stuck in,” one member observed. Even after leaving Hawaii and KETE, Sue continued studying Edo Bayashi on and off and eventually found herself playing with Jun Daiko in Mountain View alongside four other former KETE alumni. 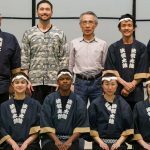 The five of them began to teach the rest of the group Edo Bayashi and shishimai, even purchasing a shishi-gashira (lion’s head costume) and performing the dance at Obon and private parties. When Jun Daiko invited Suzuki-sensei to Mountain View as part of their ACTA Living Cultures Grant in 2014, they and San Jose Taiko participated in several joint shishimai workshops and quickly realized how much they had to learn about the art form and its history. 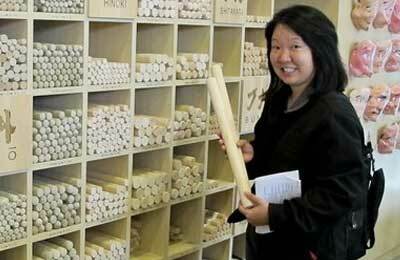 Since Jun Daiko’s series of shishimai workshops with Suzuki-sensei, Sue has been organizing a group in the Bay Area to study Edo Bayashi more in earnest. 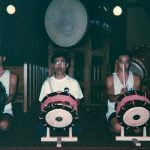 While KETE alum started their own Edo Bayashi practices, Kenny Endo continued to spread knowledge of the form throughout North America, undertaking residencies from Seattle to Minneapolis and planting the seeds for the community of taiko players studying Edo Bayashi that exists today. As further preparation for Suzuki-sensei’s time in Chicago with us, Ho Etsu will also be workshopping the pieces with Iris Shiraishi from Minneapolis, who was one of the first beneficiaries of those Edo Bayashi tours. 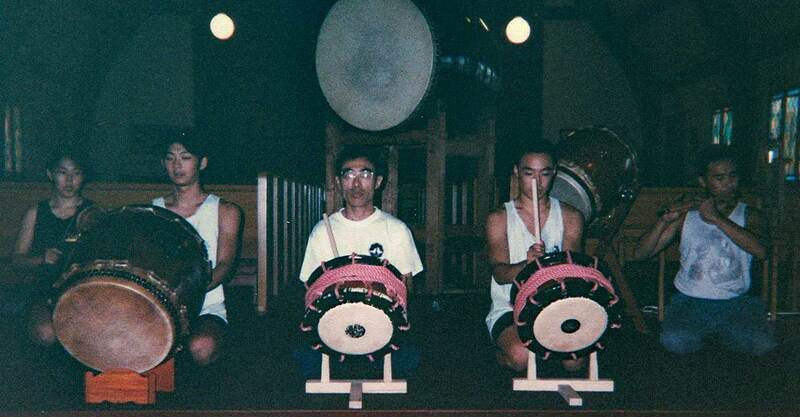 Edo Bayashi and shishimai, in their own way, certainly accomplish all three for us as taiko players. Over the course of studying it, we’ve learned how Edo Bayashi helps to form the aesthetic and historical precedent of much of contemporary taiko. In expanding our horizons and looking beyond ourselves to other taiko groups and players learning the same repertoire, we’ve seen how different parts of the taiko community can make connections (musical, cultural, or otherwise) with each other by tapping into this common language. Finally, the rhythmic and melodic toolbox it provides has helped us to break through each of our own modus operandi and to make music with greater artistic quality while staying grounded in a tradition that is larger than ourselves. Well that’s it! 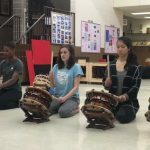 Special thanks again to Sue Kanagawa Yuen, who took the time to speak with us and tell us her stories about learning Edo Bayashi and the wider taiko community. We’ve learned a lot, and can’t wait see what the future holds! 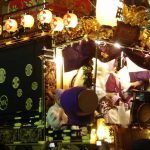 To cap off this installment of our Edo Bayashi blog, we’ll leave you with two videos that bring more life to this idea of Edo Bayashi as a kind of jazz. This is a short clip from our upcoming mini-documentary featuring Kenny Endo speaking with our artistic director, Jason Matsumoto. Kenny responds to Jason’s question about encountering Edo Bayashi for the first time. The second is a video of our mentor, Eien Hunter-Ishikawa, playing a groovy impromptu Edo Bayashi-influenced jam alongside Joe Small and Isaku Kageyama. 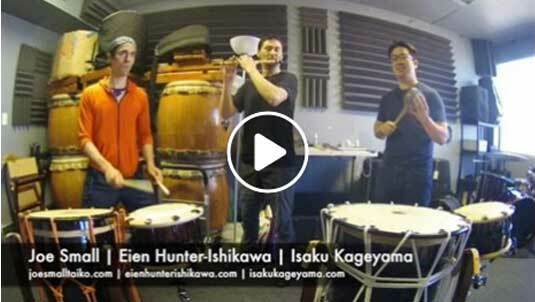 Note: the play button will take you to the Taiko Community FB page.